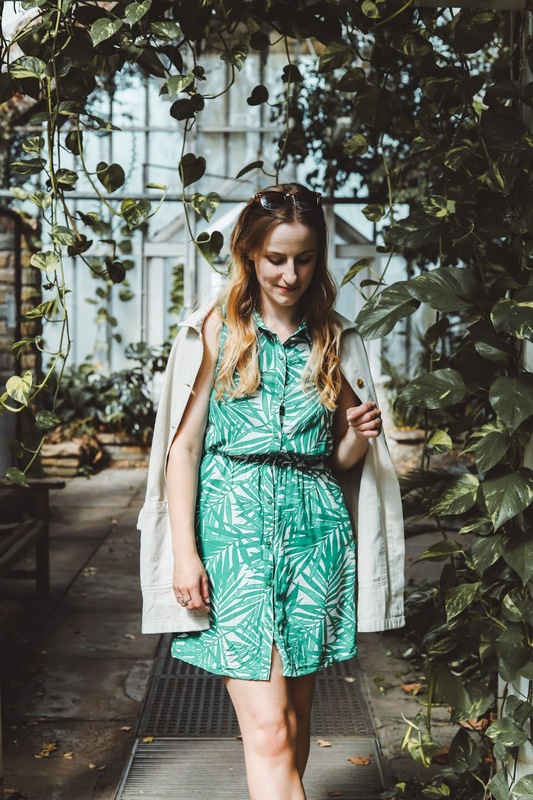 I've spoken many times on this blog about how I like to dress comfortably and how that is my priority when it comes to my wardrobe. At some point I've probably referred to myself as a 'comfort over style' kinda gal, and I'm sure many of you would view yourselves that way too. I can't wear things that aren't comfortable, whether it's a waistband that digs in, an itchy sweater or something that forever needs hoiking up, I'm just not there for that. Because of that there are definitely certain things I would never wear that are incredibly fashionable and look amazing on people. I think that's why I've always thought of myself as a comfort over style person. The expression popped into my head the other day when I was trying on these culottes from Boohoo (which are, FYI, some of the comfiest trousers I have ever owned - we all know I'm a fan of an elasticated waistband) and I was excitedly swanning around in all their comfortableness (spell check says it's a word) while at the same time thinking about how darn good they looked. The thing is, we can have both - comfort and style - and I'm not sure why I've spent so long referring to myself as 'comfort over style' when they're actually on equal footing for me. 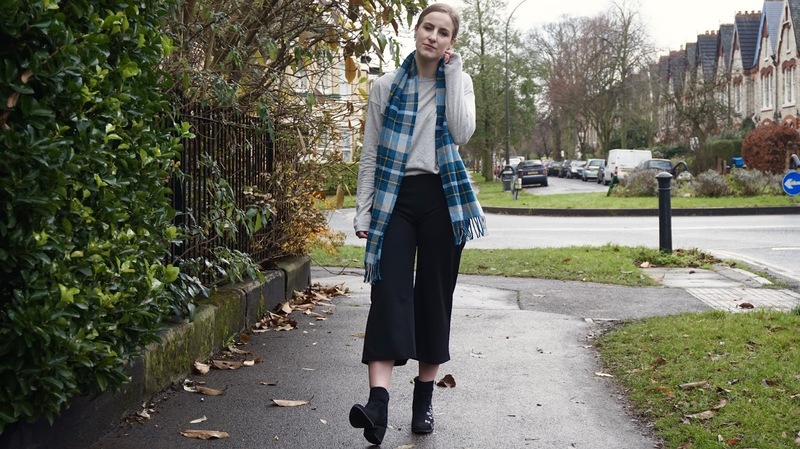 What I haven't previously taken into account is that I do still like the comfortable things I wear to look good (in my opinion anyway, form your own, personal style and all that jazz). Call me greedy (new blog name? Ha I'm so witty) but I want both comfort and style. Basically, to sum up the past two rambling paragraphs in one sentence (probably preferable for most people reading this), I love this outfit because it's insanely comfortable, but also looks good. 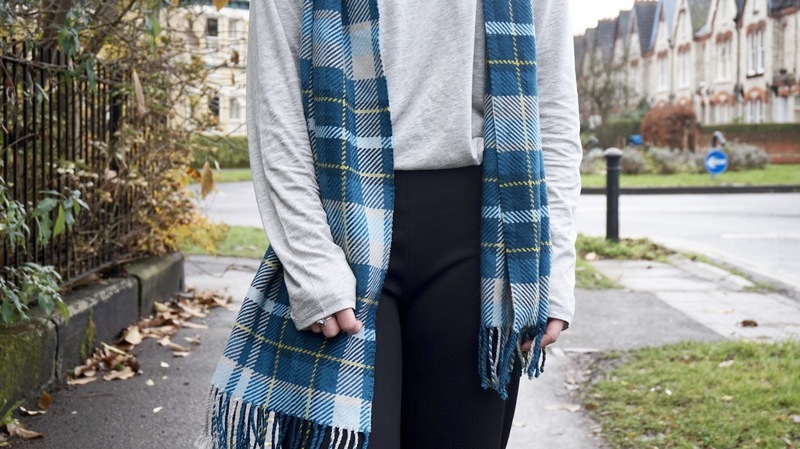 It's pretty basic, but sometimes basic really is best and I think this will become such a go to outfit in my wardrobe because it's extremely versatile depending on what you pair it with. 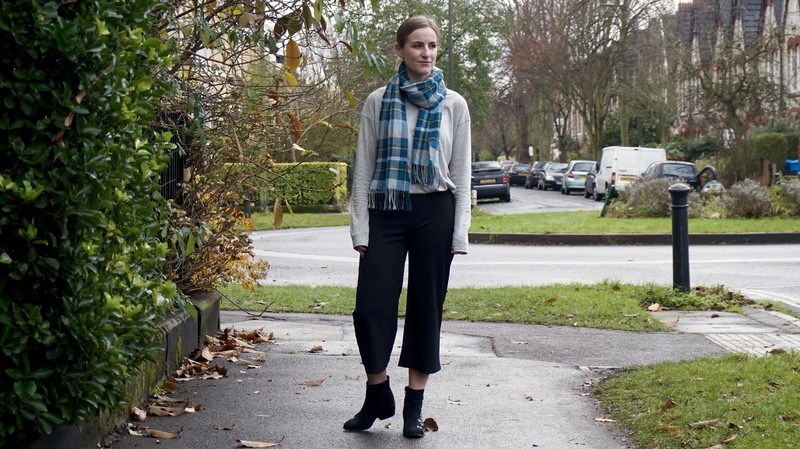 I've been after a pair of black culottes for a while now, but for some reason never got round to getting any because the ones I'd seen were all a bit too pricey and although I knew they would be such a staple I couldn't bring myself to shell out on something so basic. Then during a little Asos binge I spied these Boohoo beauties for £12. Twelve whole pounds. I think the reason they're so affordable is because they're sort of like culotte leggings (which should definitely be more of a thing) in that they're a stretchy jersey material with an elasticated waist. Despite that they seem like such good quality (I can confirm that they're not see through for one thing) and they're also somehow tailored so that they're the most flattering cut ever. Lets just say I was one happy lady when I tried these on. I also ordered this grey long line t-shirt thinking that they would make an excellent outfit paired together and they do. Ain't nothing better than basic black and grey is there? Obviously I don't really make the most of the long line aspect of this top when I'm wearing it with these, but I think it'd look great worn over jeans too. 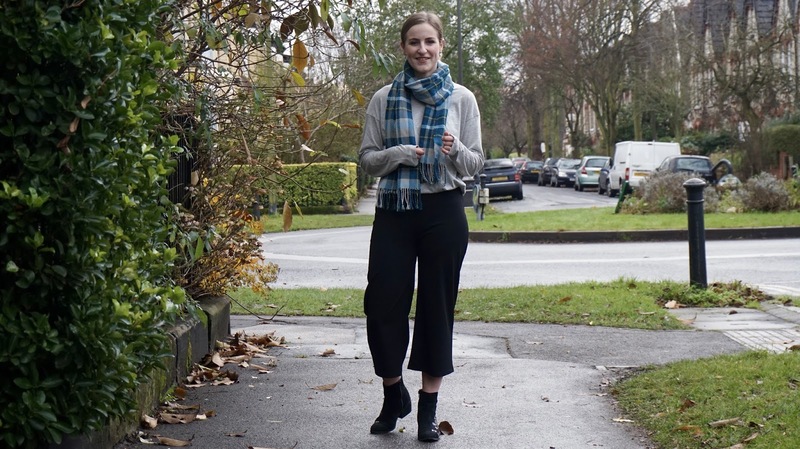 I didn't realise how matchy matchy my boots were with my outfit until I looked back at these pictures, but they're my old faithful embroidered ones. 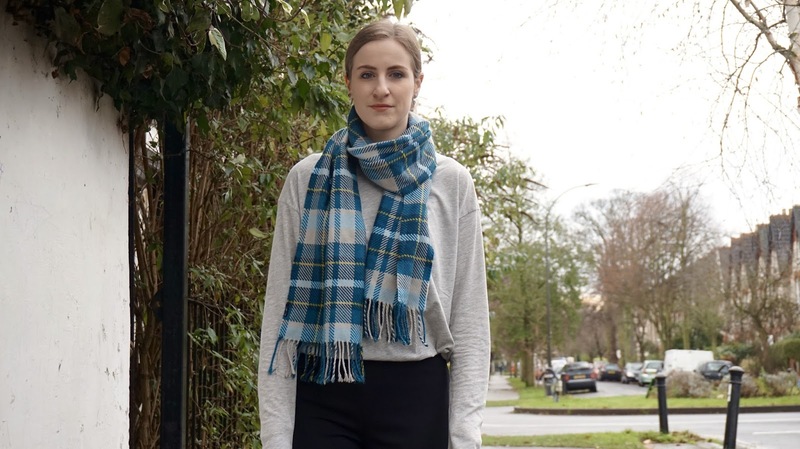 For good measure (and because it was bloody freezing) I threw on this old check scarf from H&M which I always forget I have. So there you go, an outfit that's both comfortable and stylish (at least I think so). Are you comfort over style or both? I'm all about the comfort too. Love this look Amy. 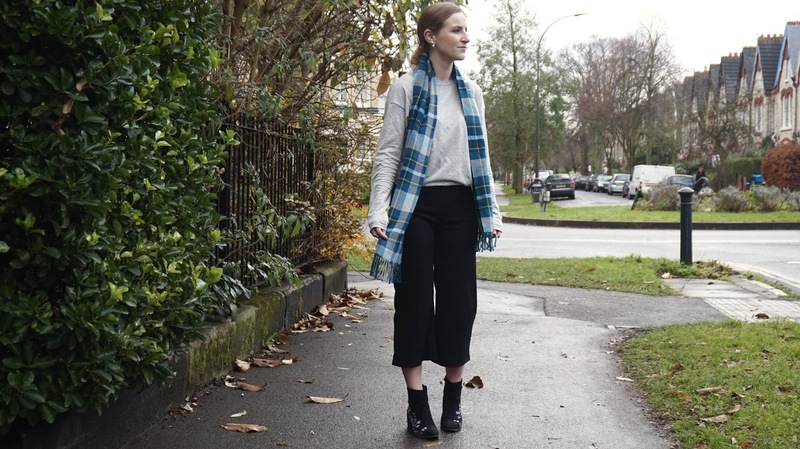 What a great outfit, especially the culottes! Comfort and style is definitely how I try to dress!! I also like comfortable outfits, and insanely comfy is really good! 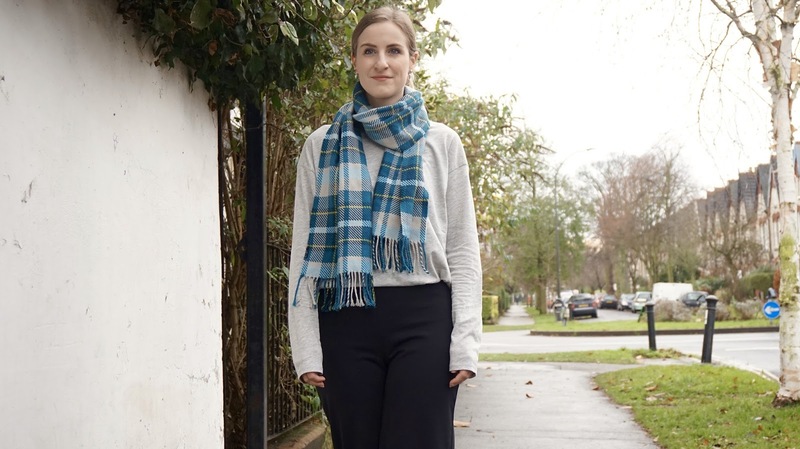 I loved your grey top and the Boohoo culottes are really great, as well as the boots and the scarf! You always look beautiful and very classy! I hope you have a beautiful week! I like my comfortable clothes to look good too, but I'll always decide whether or not to buy something over how it makes me feel more than how it makes me look. I've tried on a few things that have been so comfortable but wouldn't live up to life with two toddlers so I've not bought them in the end. I'm too used to comfortable clothes now to even consider pretty but painful pieces, ha! I love this scarf! I hope you have a wonderful holiday.